For the second weekday in a row, Katie Couric teased the CBS Evening News on Monday night by delivering President Obama's aggressive retorts to critics of his health plan as reporter Chip Reid pitched in to help, discrediting critics by disparaging their perspectives as "harsh" and "incendiary" attacks - all before Couric caught up with ABC and NBC from the night before and promoted Ted Kennedy's "We're Almost There" Newsweek cover story. Reid declared that "in some of his harshest comments yet, Republican Party Chairman Michael Steele said the President's plan for a public insurance option is socialism." But this is all Steele said in the clip Reid played: "This reckless approach is an ill-conceived attempt to push through an experiment and all of us should be scared to death." Reid continued: "In one of the most incendiary comments, Republican Senator Jim DeMint, in a conference call with conservative activists, recently said:" Viewers then heard audio of DeMint making a tactical political point: "If we're able to stop Obama on this, it will be his Waterloo. It will break him." Following Reid, Couric trumpeted Kennedy's "behind the scenes" efforts via this week's Newsweek: "Senator Edward Kennedy, who is battling brain cancer, is too ill to lead the fight for health care reform in person, but he is working behind the scenes. In Newsweek magazine, he writes: 'I am resolved to see to it this year that we create a system to ensure that someday, when there is a cure for the disease I now have, no American who needs it will be denied it.'" Reid did at least note that "it's not just Republicans who are giving the President headaches" as "dozens of conservative House Democrats are threatening to block the bill if it doesn't slash the expected costs of well over a trillion dollars." ABC's Jake Tapper and NBC's Chuck Todd also highlighted DeMint and Obama's criticism of the South Carolina Senator, but without the pejorative language ("incendiary comment") applied by Reid. A night after CBS and NBC skipped the assessment from the chief of the Congressional Budget Office (CBO) that the Senate and House health plans won't meet President Obama's pledge to not increase deficit spending, the two networks caught up only when Obama, reacting to "anxiety" even from Democrats, addressed the setback to his quest late Friday. CBS anchor Katie Couric spun the bad news for Obama into "a warning" from him about the ominous fate which awaits Americans if he does not succeed. "Also tonight, a warning from the President," she teased Friday's CBS Evening News before a clip of Obama with a very suspect claim: "If we don't get health care reform done now, then no one's health insurance is going to be secure." Couric introduced the story by portraying Obama as the hero trying to reach a noble goal: "President Obama today continued his hard sell for health care reform, but he also had to do a little doctoring, treating a case of sticker shock over the latest proposals for insuring nearly every American." Today, another dramatic push, this time from an ailing Ted Kennedy, absent from Washington but appearing on the cover of Newsweek and writing: "This is the cause of my life. We will have decent, quality health care as a fundamental right and not just a privilege." KATIE COURIC: President Obama is waging an all-out battle for health care reform. The fear at the White House is he's losing momentum as the opposition gets louder. So if you thought you've been seeing a lot of the President on television already, get ready for a whole lot more. Here's our chief White House correspondent, Chip Reid. CHIP REID: With congressional opposition on the rise and public support slipping, the President today tried to get health care reform back on track. PRESIDENT BARACK OBAMA: There are too many families who will be crushed if insurance premiums continue to rise three times as fast as wages. MAN IN TV AD: When I lost my job, I lost my health insurance, too. REID: -with TV ads aimed at wavering Senators, mostly Democrats, in eight states. MAN IN AD: It's time. WOMAN IN AD: It's time for health care reform. REID: Republicans fired back with their own ad campaign. ANNOUNCER IN TV AD: A risky experiment with our health care. MICHAEL STEELE, RNC CHAIRMAN: It's too much, too fast. REID: -Republican Party Chairman Michael Steele said the President's plan for a public insurance option is socialism. MICHAEL STEELE: This reckless approach is an ill-conceived attempt to push through an experiment and all of us should be scared to death. 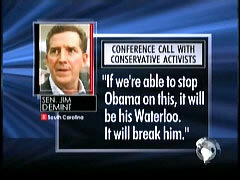 AUDIO OF DeMINT: If we're able to stop Obama on this, it will be his Waterloo. It will break him. REID: Today the President accused DeMint of using the health reform debate for political gain. OBAMA: This isn't about politics. This is about a health care system that's breaking America's families. REID: But it's not just Republicans who are giving the President headaches. REP. MIKE ROSS, (D) ARKANSAS: We need to slow down. REID: Dozens of conservative House Democrats are threatening to block the bill if it doesn't slash the expected costs of well over a trillion dollars. ROSS: Develop a bill that can really result in the kind of savings that will cause health care to stop growing. REID: Others are resisting the President's goal of passing a bill by early August. SENATOR KENT CONRAD, (D) NORTH DAKOTA: Sometimes when you move too quickly you make mistakes. That, to me, is the big concern. REID: Today, the President said he still wants the House and Senate to meet that August deadline for passing their initial bills, but he gave himself a little bit of wiggle room. He said that it may spill over a few days or a week. Katie? COURIC: So is there a growing feeling at the White House, Chip, that the President might have set expectations for expediency a bit too high? REID: Well, you would certainly think so, Katie, with the polls coming down, with the criticism just flowing in from Republicans and even some Democrats really nervous about the bill and this timeline, you would think that they would back off. But, Katie, they have not. They really are as confident as ever here at the White House that this is going to pass. And if it doesn't pass right on the deadline, it won't be much behind it. COURIC: Alright, Chip Reid at the White House tonight. Thank you, Chip. Senator Edward Kennedy, who is battling brain cancer, is too ill to lead the fight for health care reform in person, but he is working behind the scenes. In Newsweek magazine, he writes: "I am resolved to see to it this year that we create a system to ensure that someday, when there is a cure for the disease I now have, no American who needs it will be denied it." And tomorrow night I'll have an interview with President Obama about health care reform and much more.